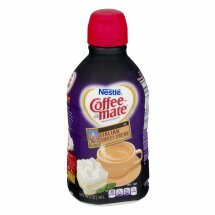 Nestle® Coffee-Mate® Coffee Creamer Italian Sweet Creme.Italian series.Artificial flavors.64 fl oz (2 qt) 1.89L. Per 1 tbsp.35 Calories.0g Sat fat, 0% DV.20mg Sodium, 1% DV.5g Sugars.64 fl oz (2 qt) 1.89 L.
Water, Sugar, Vegetable Oil (High Oleic Soybean and/or High Oleic Canola), and less than 2% of Sodium Caseinate (a Milk Derivative)**, Mono-and Diglycerides, Dipotassium Phosphate, Cellulose Gel, Salt, Natural & Artificial Flavor, Cellulose Gum, Sucralose, Carrageenan. ** Not a Source of Lactose.